Hungarian-born Gitta Alpár (1903-1991) was a Jewish opera and operetta singer, who had a successful film career in Germany. Her career and her marriage to film star Gustav Fröhlich were destroyed by the Nazis. German postcard by Ross Verlag, no. 6683/2, 1931-1932. Photo: FFG. German postcard by Ross Verlag, no. 7049/1, 1932-1933. Photo: Frhr. von Gudenberg Phot. German postcard by Ross Verlag, no. 8756/1, 1933-1934. Photo: Angelo Fotos. Gitta Alpár was born as Regina Kalisch in Budapest, Austria-Hungary (now Hungary) in 1903 as the daughter of a cantor, a clergy member who fills a diverse role within the Jewish community. At 16, she studied singing and pianoforte at Liszt Ferenc Zeneművészeti Egyetem, the conservatory of Budapest. With it she laid the foundations of a successful singing career. Her first public appearance as a coloratura soprano under the name of Alpár was in 1923 at the Magyar Állami Operaház (Hungarian State Opera House) in Budapest. Later she moved on to Berlin, where she sang in operas like Die Zauberflöte (The Magic Flute) by W.A. Mozart as the Queen of the Night, Il barbiere di Siviglia (The Barber of Seville) by Gioacchino Rossini, and Rigoletto and La Traviata, both by Giuseppe Verdi. Dutch postcard by Remaco, no. 236. 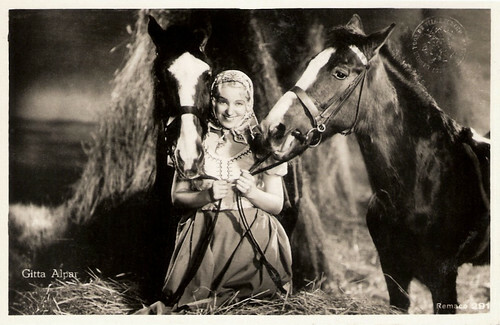 Publicity still for Gitta entdeckt ihr Herz/Gitta Discovers Her Heart (Carl Froelich, 1932). Dutch postcard by Jospe, no. 379. Photo: Remaco. 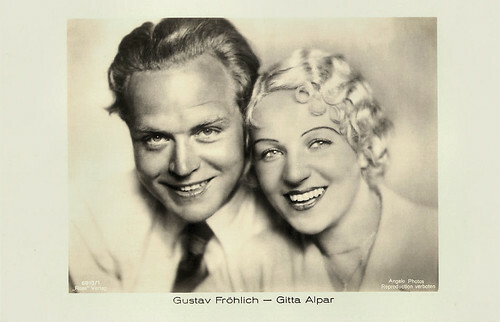 Gitta Alpár and Gustav Fröhlich co-starred in Gitta entdeckt ihr Herz/Gitta discovers her heart (Carl Froelich, 1932). Dutch postcard by Remaco, no. 291. Photo: publicity still for Gitta entdeckt ihr Herz/Gitta Discovers Her Heart (Carl Froelich, 1932). In 1930, Gitta Alpaá had a huge success in the operetta Der Bettelstudent (The Beggar Student) by Carl Millocker at the Metropol Theater in Berlin, and she was hailed as 'the new operetta diva'. At the Metropol Theater, she next created the role of Princess Elisabeth in the operetta Schön is die Welt (The World is Beautiful, 1930), a reworking of Endlich allein (Alone at Last) by Franz Lehár. Her co-star was Richard Tauber, and they recorded several excerpts for the Odeon Records company. 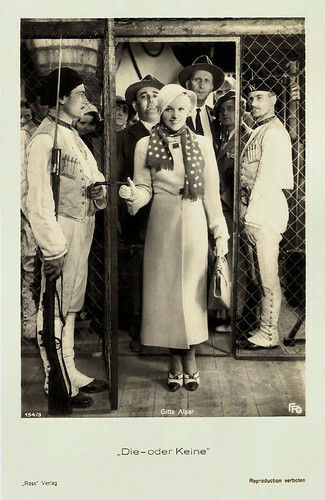 At the Admiralspalast in Berlin, she then played Marie Jeanne Bécu, a milliner, later Comtesse Dubarry in Die Dubarry (The Dubarry, 1931), the radically revised version of Gräfin Dubarry (Dubarry) by Carl Millöcker. The new version was prepared by Theo Mackeben with music from the original Gräfin Dubarry as well as other works, and a new text was written by Paul Knepler, Ignaz Michael Welleminsky and Hans Martin Cremer. Also in 1931, Gitta Alpar married film star Gustav Fröhlich, with whom she had a child, Julika Fröhlich. She had been married before to a businessman in Budapest. The film industry became aware of the new darling of the public. For Carl Froelich-Film GmbH (FFG), she made films like Gitta entdeckt ihr Herz/Gitta Discovers Her Heart (Carl Froelich, 1932) with Gustav Fröhlich, and Die - oder keine/She, or Nobody (Carl Froelich, 1932), in which she co-starred with Max Hansen. German postcard by Ross Verlag, no. 154/3. Photo: FFG. Publicity still for Die - oder keine/This One or None (Carl Froelich, 1932). German postcard by Ross Verlag, no. 7159/1, 1932-1933. Photo: FFG. 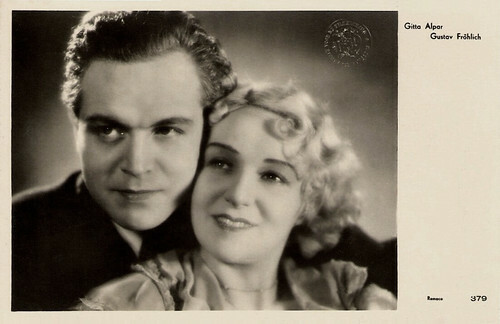 Publicity still for Die - oder keine/This One or None (Carl Froelich, 1932) with Max Hansen. With Gustav Fröhlich. German postcard by Ross Verlag, no. 7926/1, 1932-1933. Photo: Niedecken, St. Moritz. 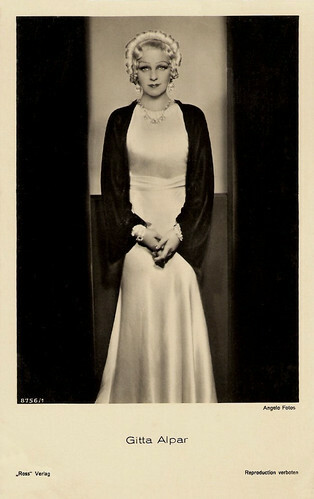 In 1932, Gitta Alpár had another stage success at the Großes Schauspielhaus, Berlin, when she created the part of Madeleine de Faublas in the operetta Ball im Savoy (Ball at the Savoy) by Paul Abraham to a libretto by Alfred Grünwald and Fritz Löhner-Beda. This was Abraham's last major success, but also Alpár's. At the top of her success, Gitta Alpár's career abruptly came to an end because of the rise to power of Adolph Hitler. Alpár was Jewish and despite her popularity she was forced to leave Germany. Her marriage to Gustav Fröhlich was dissolved in 1935 because it was illegal in National Socialist Germany. Fröhlich distanced from his wife because he didn't want to endanger his career. He later tried to apologise for his behaviour but Gitta Alpár was not able to answer his prayers. A circumstance which, according to IMDb, gave Fröhlich a hard time in his last leaving years and which beclouded his lust for life. Alpár first emigrated to Austria where she took part in the film Ball im Savoy/Ball at Savoy (Steve Sekely, 1935) with Rose Barsony, another Jewish film actress who was forced to flee Nazi Germany. Alpár also acted in the British film I Give My Heart/The Loves of Madame Du Barry (Marcel Varnel, 1935), a faithful adaptation of the stage opera Die Dubarry (The Dubarry) with Owen Nares. Hal Erickson reviews at AllMovie: "The seamier aspects of DuBarry's rise to prominence (notably her brief stopover at a house of ill repute) are neatly glossed over, but that was to be expected. Among those responsible for adapting The Dubarry to the screen was Curt Siodmak, who together with his brother Robert went on to a rewarding Hollywood career". Until 1936, Alpár worked in Austria, but then she had to emigrate again, first to Great Britain and one year later via Argentina to California. 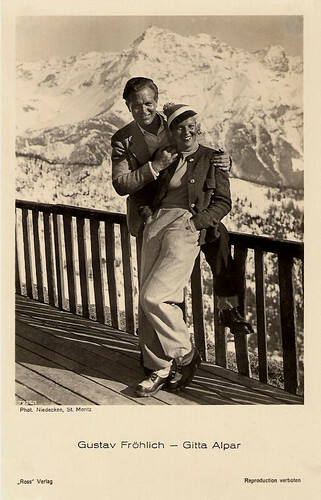 In Great Britain, Alpár appeared in Guilty Melody (Richard Pottier, 1936) with Nils Asther, and Everything in Life (J. Elder Wills, 1936). Guilty Melody (1936) was an alternative language version of the French film Le disque 413/Disk 413 (Richard Pottier, 1937) in which Alpar also starred, now opposite Jules Berry. Her final film appearance was an appearance as an opera singer in the Universal Pictures period comedy/drama The Flame of New Orleans (René Clair, 1941) with Marlene Dietrich. Much of the film takes place with a background derived from Donizetti's Lucia, the love duet in the beginning of the opera. According to IMDb, her Hollywood career ultimately failed as a result of her heavy accent and poor command of the English language. In 1939 she married Niels Wessel Bagge. They divorced in 1951. After the war Gitta Alpár earned her living as a singing teacher. She seemed to be forgotten, but in 1987 Germany honoured her with the Filmband in Gold for her contributions to the German cinema. In 1991 Gitta Alpár passed away in Los Angeles, just before her 88th birthday. With Gustav Fröhlich. German postcard by Ross Verlag, no. 6810/1, 1931-1932. Photo: Angelo Photos. Dutch postcard by JosPe, no. 585. Sent by mail in 1935. 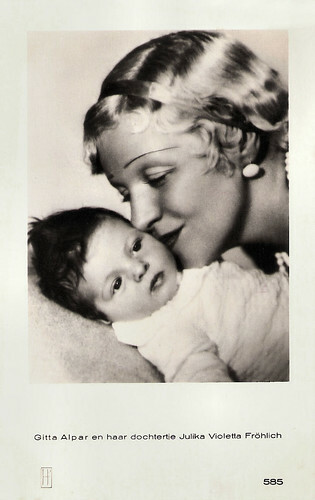 Caption: Gitta Alpár and her little daughter Julika Violetta Fröhlich. German postcard by Ross Verlag, no. 7505/2, 1932-1933. Photo: Frhr. von Gudenberg Phot. Gitta Alpár sings In meinen weißen Armen in Ball im Savoy (1935). Source: Alparfan (YouTube). Sources: Thomas Staedeli (Cyranos), Karin Nusko (Universität Wien), Hal Erickson (AllMovie), Wikipedia and IMDb.